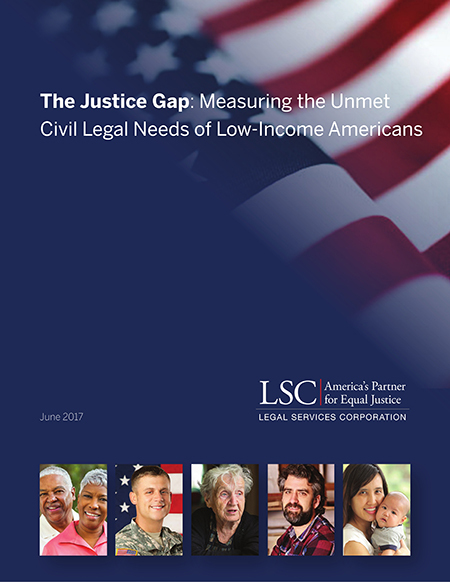 WASHINGTON – On Wednesday, June 14, the Legal Services Corporation (LSC) will issue a new report, The Justice Gap: Measuring the Unmet Civil Legal Needs of Low-Income Americans. The report will be released at an event in room 385 of the Russell Senate Office Building from 11 a.m. to 12:30 p.m. EST. Speakers at the event will include Rep. Susan W. Brooks (IN-5); Rep. Joseph P. Kennedy III (MA-4); Harriet Miers, LSC Leaders Council Co-Chair and former White House Counsel; Ken Frazier, LSC Leaders Council Co-Chair and CEO of Merck & Co.; Jim Harbaugh, LSC Leaders Council Member and University of Michigan Head Football Coach; American Bar Association President Linda Klein; and J. Michael Dennis, Senior Vice President of NORC at the University of Chicago and Executive Director of AmeriSpeak. The report is a study of the "justice gap" in the U.S.—the difference between the civil legal needs of low-income Americans and the resources available to meet them. Last year, 86% of the civil legal problems reported by low-income Americans received inadequate or no legal help at all. The need for basic civil legal assistance for people who cannot afford to pay for it is overwhelming. Seventy-one percent of low-income households in the country experienced at least one civil legal problem in the past year. One in four low-income households experienced six or more civil legal problems, including 67% of households with survivors of domestic violence or sexual abuse. These problems included critical issues such as veterans’ benefits, domestic violence, disability access, housing conditions, and health care. LSC is the single largest funder of civil legal aid programs in the United States, supporting 133 legal aid organizations across the United States, the District of Columbia, Puerto Rico, and the territories. LSC-funded legal aid programs will serve an estimated 1 million Americans this year, but will be able to fully address the civil legal needs for only about half of them largely due to a lack of resources. In total, low-income Americans will approach these organizations for assistance with an estimated 1.7 million problems, but will receive only limited or no legal help for between 62% and 72% of their problems. Not receiving help can have a severe impact on people’s safety, stability, and health. Seven in 10 low-income Americans with recent personal experience of a civil legal problem say it has significantly affected their lives. "This study shows two things: first, the vast majority of low-income Americans have significant civil legal needs that affect their families, their livelihoods, and their safety; and second, our civil legal system fails, overwhelmingly, to meet those needs,” said LSC President James J. Sandman. "The bottom line: We are not fulfilling our nation's solemn pledge of 'justice for all.'" LSC contracted NORC at the University of Chicago to help prepare this report. NORC conducted a survey of approximately 2,000 adults living in households at or below 125% of the Federal Poverty Level—$15,075 for an individual and $30,750 for a family of four. More than 60 million Americans fall into this category, including approximately 7 million rural residents and 6.5 million seniors and more than 1.7 million veterans and 11.1 people with disabilities. The report also includes additional data that LSC collected from its grantees. Members of the press are invited to attend the briefing on the report’s release. The Justice Gap report was made possible by the support of the William and Flora Hewlett Foundation and the Kresge Foundation.